It’s now official, Samsung has announced the Galaxy A2 Core in India at an affordable price segment. The phone was announced with the least powerful specifications which makes it a cheap device you can buy. 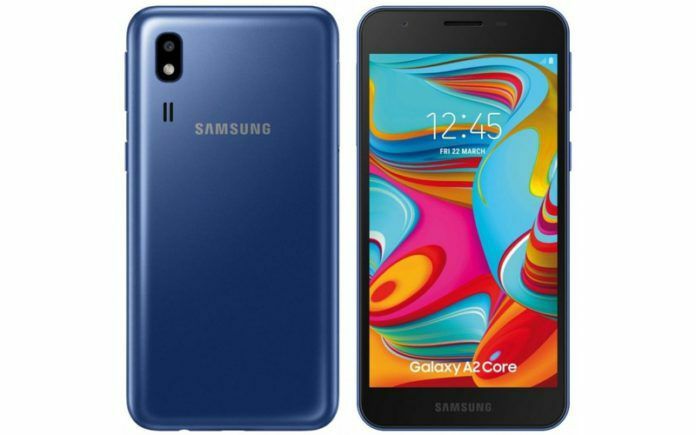 The Samsung Galaxy A2 Core is running on Android Go edition. The phone is the third phone to run in Go Edition after the Samsung Galaxy J2 Core and the J4 Core that was released last year. From the looks of things, it seems the J series will now represent budget phone from Samsung that will be running on Go Edition. The Samsung Galaxy A2 Core is built with a decent body that is wrapped with polycarbonate material and it comes in Black and Blue colors variants. The phone only shortcoming is that it lacks a fingerprint sensor and the thick bezel both on the top and bottom of the screen is also annoying. Considering the price tags, it’s still a good device to buy because it will deliver smooth performance with the Go Edition in charge. The handset has a screen display size of standard 5-inch with a resolution of 540 x 960 pixels. It’s powered by Exynos 7870 with an octa-core processor that clocked at 1.6GHz. It has an average inbuilt memory that consists of a 1GB RAM with an internal storage of 16GB which has a slot for micro SD card up to 256GB max. On the back, it has a single rear camera of 5MP and on the front, it also has a single rear camera of 5MP for selfies. It has dual SIMs support and it runs on Android 9.0 Pie based on Go Edition out of the box. Booting the phone is 2,600 mAh and it has support for 4G VoLTE. The Samsung Galaxy A2 Core is now available in India market at a price of RS 5,290 which roughly convert to $75. You can buy the phone at any available offline stores across the country.